You are currently browsing the category archive for the ‘Stonehenge’ category. The Amesbury & Stonehenge Lantern Procession to Blick Mead 2018. This event saw around 200 local people gather to mark the midwinter Solstice on December 21. Having settled into a tradition over the last seven years, the occasion was launched with an ornate lantern transported to Stonehenge to be lit at sunset in an act representing the capturing of the dying rays of the old year. Commissioned by the Amesbury Museum and Heritage Trust in 2011 and created by Andy Rawlings and Michelle Topps, the lantern is an astonishing work of art with stained glass leadwork representing the World Heritage Site landscape. The transportation of the lantern to the globally famous stones is undertaken by a local woman chosen annually as the Solstice Fairy. The lighting of the lantern is undertaken whilst a guardian ritual is enacted by an overseeing Druid. Having been lit the lantern is transported to Blick Mead, where it is placed adjacent to the spring to await the lantern procession that has been gathering meanwhile in Amesbury. The Solstice Fairy then leads the gathering of adults and children, each carrying their own lanterns, in procession to Amesbury Abbey. Here the participants are greeted with mulled wine and mince pies, thanks to the generosity and hospitality of the Cornelius-Reid family and the Amesbury Abbey Nursing Home. On departing the Abbey refreshed and proceeding to Blick Mead, the procession forms a circle around the lantern to take part in an enjoyable and thoughtful ceremony reflecting on the year that has passed and the year to come. When the circle breaks the participants return home, meanwhile the lantern is safeguarded overnight then transported back to Stonehenge to be extinguished on the midwinter Solstice line as the sun rises the following day. Participation in the lantern procession is free and the tradition has been embraced by local people in an act reconnecting them with Stonehenge and the Mesolithic community that inhabited Blick Mead. Many thanks to Jeff Welch for sharing his wonderful photographs of the event this year. Please note that Blick Mead is on private land, access is not possible throughout the remainder of the year. The “result” of consultations on options for widening the A303 across the Stonehenge World Heritage Site is yet to be announced – or “presented through an undemocratic lense” one might say. There will be no surprises. It will be said to point to popular and expert enthusiasm for the protection and enhancement of the World Heritage landscape – hoorah! – but a version of protection and enhancement which will have an unspoken opposite effect. How could it be otherwise, given Highways England’s and the Government’s stated aims? Let no-one be in doubt: their primary aim is not to protect and enhance the World Heritage landscape and it never was. They can only do that without building a surface dual carriageway. This is a tragedy that has been long in the making. In 2012 Simon Jenkins smelt a rat about the Olympic opening ceremony. Was its depiction of rural Britain as “a land of fields and ploughmen, cottages, cows, sheep and horses, of Glastonbury, cricket and the Proms” a cover for a more radical vision, and was the countryside in the cross hairs of the Government and its developer friends (who kindly helped them fashion the new Planning approach)? Should the name of the ceremony be changed from “The Isles of Wonder” to “Goobye to all that”?! Now that one of our most loved views, the free view of Stonehenge from the A303, is intended to be snatched away forever, his words still have great resonance: “Ministers may win Right-wing guffaws in think-tank saloons. But it is their deeds now being scratched and scarred across the face of England that we shall remember.” The scratches and scars, if allowed to happen, will outlive Chris Grayling and the rest by millenia. UNESCO spells it out: a short tunnel is NOT ACCEPTABLE! After years of biased advocacy, the short tunnel supporters (the Government, its 3 “yes-bodies” and a thin veneer of allegiant archaeologists) just had a clear reply from UNESCO: the short tunnel should be scrapped! So the question now arises, what will they do? Accept it? Or ignore it and carry on regardless? Highway’s England’s hurried initial reaction suggests the latter: “We remain confident our scheme will enhance and protect the Stonehenge landscape.” That meaningless statement often works for developers seeking to build a few houses in small villages. But this is no village, it’s the Stonehenge World Heritage Site and this is no parish council UNESCO are talking to – it’s the world. So far as we can see the Government can react in one of two ways. It can say, fair enough, we’ve miraculously found the finance to avoid harming the landscape. OR, and this is our guess, it can get some friendly archaeologists to start discrediting UNESCO in the public mind. Keep watching. We’ll know soon! Stonehenge: Britain to solve it by doing a Trump? What do you do when the world’s leading heritage body opposes your ambitions? Demonise it? Is Simon Thurley, ex English Heritage leader, doing exactly that for the British Government? Oh Simon! Who asked you to write that? 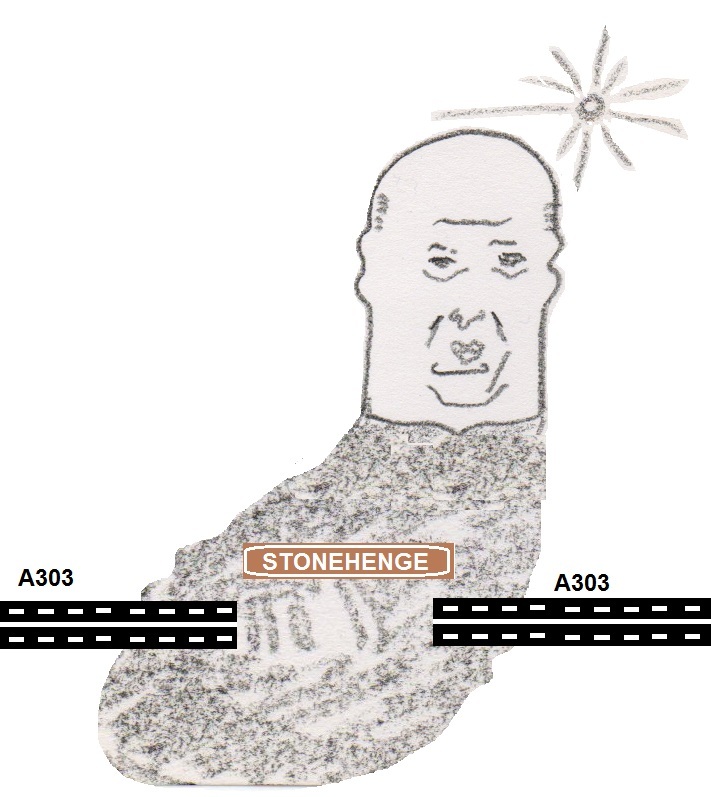 The various current proposals for altering the A303 around Stonehenge all share a common theme in that they will all be bad for local wildlife. The Great Bustard Group (GBG) has worked hard to try and ensure the iconic Great Bustard is at least considered during the various meetings, consultations and reviews. It has been an uphill battle with each new team of consultants or experts having to be identified and then briefed from scratch. 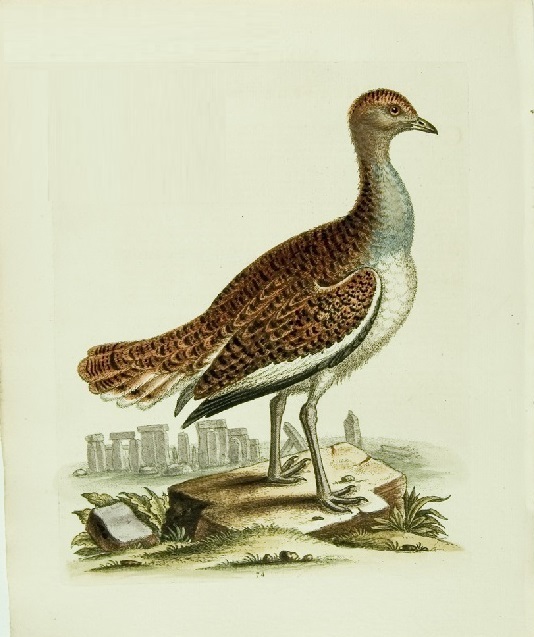 One expert working for Highways England confidently announced they had been told there were no Great Bustards in the area. GBG staff took them out and showed them over 15, almost in sight of the Stones. The next meeting comes along and there is a new face, who knows nothing about the birds. A new threat to the recently restored population of Great Bustards now exists. Ground Water & Ecological surveys are taking place in the fields around Stonehenge. These are now involving teams in hi-viz clothing and vehicles with loud reversing beepers and they will be roving the fields used by some of the rarest birds in the UK for nesting. That this should be taking place anywhere during the bird nesting season is concerning, but in an area with nesting Great Bustards and the rare and sensitive Stone Curlew it is particularly concerning. The birds will either be denied the places to nest, or the worse scenario is that they will abandon their eggs due to the disturbance. The GBG was told about the latest works but only days after they had started. No Great Bustards have been released within miles of Stonehenge and the birds have moved into the area naturally, and have nested there. The GBG works closely with local farmers and land owners to do everything possible to ensure the Great Bustard nests are successful. “Alarmist and untrue”? Then let the public be the judge! Perhaps the public can judge if this is the case. The attached images are of one of the dozens of trenches Highways England excavated in the field where Mr Bullock was interviewed by Paul Clifton of BBC South yesterday, it cut straight through Bronze Age archaeology already known to be there. Why then destroy it? 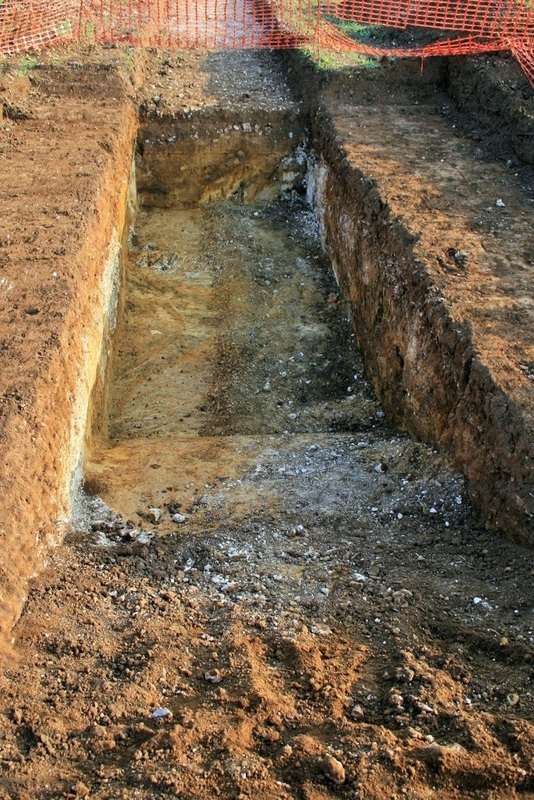 Oh, we forgot, according to Highways England they were looking to see if anything was there and if it was then it isn’t destroyed – David Bullock can perhaps explain how the layers of archaeology and context destroyed by this trench simply reassembles itself when backfilled? The worrying actuality of this typically brutal assault in the Stonehenge landscape is that more archaeology has been destroyed by ruthless evaluation schemes connected with visitor centre sites and proposed road routes in the World Heritage Site than anyone wants to publicly admit. The vast majority of this destruction, as in the present case, is carried out in the name of a perceived threat as opposed to a scheme that was actually known to be going ahead. Depressingly, the methods used in these cases have not been to the same standards to which academic research is carried out. As for what happens to the archaeology that isn’t dumped back in the trench as spoil – even the archaeological evidence painstakingly collected by Julian Richards during the Stonehenge Environs Project was dumped without even asking him or the landowner if they wanted it back. “Alarmist and untrue”? We think not! In recent weeks farmers have kept machinery off the fields due to the wet conditions, pedestrian access to the Stonehenge permissive path has been closed by English Heritage and access to Avebury henge has similarly been closed by the National Trust to prevent footfall erosion. And yet Highways England’s contractors have been using a mechanical digger to excavate archaeological evaluation trenches in a field adjacent to Longbarrow Roundabout, just beyond the western boundary of the Stonehenge World Heritage Site (WHS). 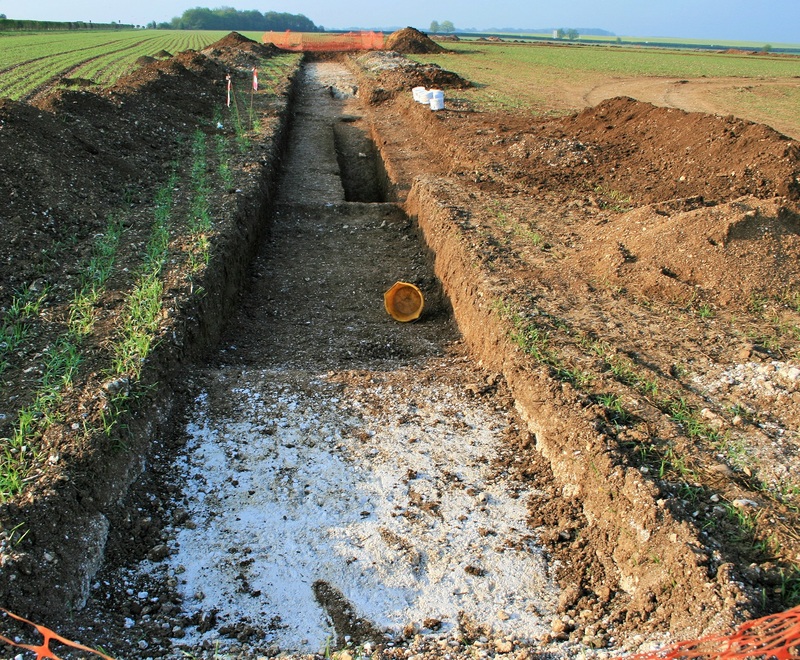 This work is being undertaken in connection with the proposed Stonehenge tunnel scheme. The use of a heavy machine, which in continually moving back and forth in the current wet soil conditions would likely devastate any fragile archaeological deposits, underlines the threat that will soon reach the WHS. This was signalled when Highways England’s contractors started hand digging test pits in a nearby farmer’s field within the WHS last week. Located alongside the A303, between the area currently occupied by pigs and the A360 at Longbarrow Roundabout, this area is ankle deep in a crop masking the environs of an Early Bronze Age settlement lying across and within the boundary of the WHS. This area of archaeological interest lies in the path of a proposed 1.2 km length of dual carriageway within the WHS, which would lie in a cutting 40–78 metres wide and 8 metres deep. The cutting stretches east from the A360, through the area now occupied by pigs to the proposed western tunnel portal location, at Normanton Gorse. We are told hundreds of archaeological test pits are proposed, to be followed by a herringbone pattern of trenches over the whole area. 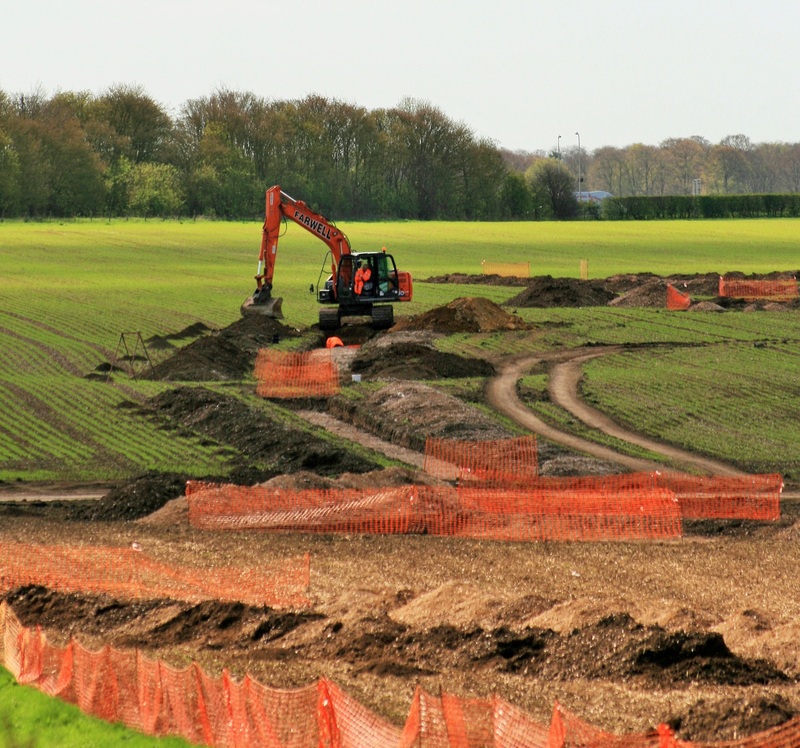 Why has Highways England started this archaeological evaluation now when a growing crop will thwart field walking surveys, cloying earth is difficult to sieve for finds, and the introduction of a digger onto saturated ground could see fragile archaeological evidence lost forever? 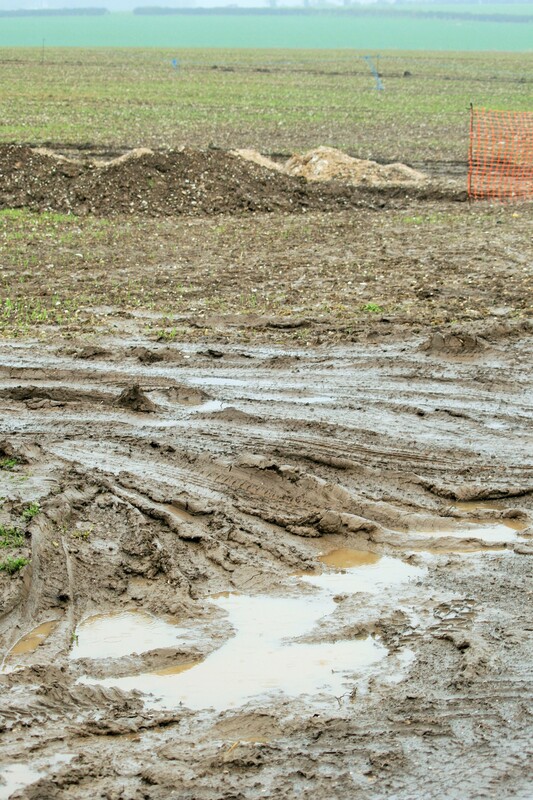 If the investigations had been put off until the ground dried out the risk of damage would considerably reduce, but the timetable has been compressed by Highways England’s failure to engage constructively with landowners and farmers in the WHS, with no account of the farming calendar or extremely wet conditions exacerbated by periods of heavy snow. 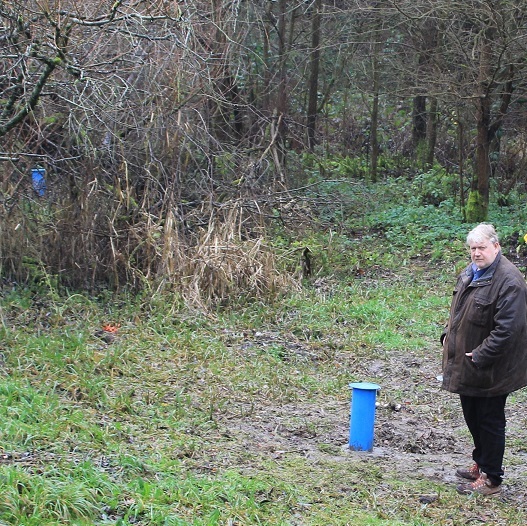 More to the point perhaps – why is this invasive and destructive investigation taking place at all when, if the road scheme is agreed, the archaeology in its path would have to be properly excavated anyway? The public traveling along this stretch of the A303 will unwittingly bear witness to the impact of Highway England’s industrial approach to WHS archaeology. The archaeological work will continue for many weeks to come, yet the public can hardly be aware of what this activity means without the focus the media can bring. We hope the world’s media will help by monitoring what Highways England is doing, supposedly in the public interest, because there is no one that will keep an eye on this activity like the independent media can!